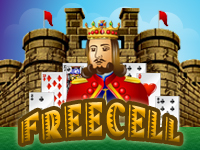 Freecell is a variation of the well known solitaire patience. It is similar to more complex solitaire games however, almost all games are winnable. Put the 52 cards in the four boxes provided to win the game. FreeCell is a variant of solitaire. The playing area consists of four foundation cells in the upper right corner and four free 'working' cells in the upper left corner. The cards are distributed in eight cascading columns at the beginning of the game so that all cards are visible. The objective is to discard all cards into ascending piles on the foundation cell of their suit - starting with the aces as they become available. You can move individual cards from the bottom of each cascade (bottom of the screen).. to one of the free cells - which act as an additional 'working area'. You must build the cascades downwards in alternating colors, and descending rank (numerical value) - by transferring cards (or multple cards) from other cascades. You may also take individual cards from any of the free cells, to extend the cascades. Cards may be moved from the free cells or the bottom of cascades to the correct foundation cell (they must be contiguous, ascending, and of the correct suit). The purpose of manouvering the cascades is to expose cards that can be placed onto the foundation cells. You may move multiple cards from the end of a cascade - the number of cards you can move at once is the number of empty free cells plus one. Prioritise columns where aces and twos are buried deeply, try and empty these columns quickly using free cells to hold cards whilst you 'dig out' the aces. Move the aces to the foundation cells as quickly as possible. Use free cells to form runs and reorder columns. The more free cells you have empty, the long the runs (sections of cascades) you can move, giving you many more options. Try wherever possible to clear entire columns. Then refill the columns with sequences starting with a king. If the king is not available, start with the highest card possible.